It's no secret that sedentary behavior contributes to obesity and chronically poor health. But not all sedentary behaviors are created equal, according to a new study that examines the link between blood pressure in children and their choice of inactive pastimes, including watching TV, using the computer and reading. Researchers in the U.S. and Spain collaborated on the study of 111 children ages 3 to 8 and found that of all the forms of inactivity they examined, television-viewing was the worst. It was linked to significantly higher blood pressure in children  the more TV kids watched, the higher their blood pressure  and the effect held true regardless of whether a child was heavy or at a healthy weight. What's more, other sedentary behaviors, like using a computer, were not associated with similar blood-pressure hikes, according to the study, which was published in the Archives of Pediatric and Adolescent Medicine. "These results show that sedentary behavior, and more specifically television-viewing, is related to blood pressure independent of body fat or obesity level," says Dr. Joey Eisenmann, a kinesiologist at Michigan State University and one of the study's co-authors. To determine levels of inactivity over one week, the children in the study wore accelerometers, which resemble pedometers but instead of tracking distance, they record the body's acceleration in a vertical plane  sitting results in a score of zero, and walking and running produce progressively higher scores. The researchers considered anything under a score of 50 per day as sedentary. They coupled this data with reports from the children's parents about how much time the kids spent in inactive pursuits, including watching television, sitting at a computer, playing video games, reading or doing other projects that don't require much movement. The children were sedentary for five hours each day, and 1.5 of those hours were spent in front of a TV, computer or video game, on average. When the researchers further broke down screen time by activity, TV-viewing had the strongest correlation with higher blood pressure. 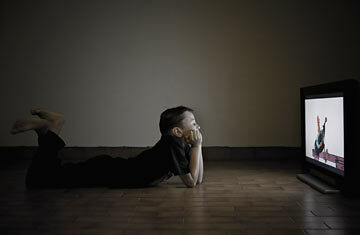 Kids watching from 90 to 330 minutes of television each day had systolic and diastolic blood-pressure readings (the two numbers that indicate pressure caused by blood pumping from the top and bottom chambers of the heart, respectively) that were five to seven points higher than those of children watching less than half an hour of television a day. "These results show that TV-viewing really is the worst of all possible sedentary activities," says Dr. David Ludwig, director of the Optimal Weight for Life Program at Children's Hospital Boston, who was not part of the study. The American Academy of Pediatrics recommends that children under 2 should not watch any television and that older children limit their viewing to one to two hours per day. So what is it about watching TV that's worse than playing video games or surfing the Internet? Certainly, playing games and using computers involve some movement, like fidgeting or changing body positions, but is that enough to explain the difference? The study's authors propose several other possible explanations. For instance, beyond the complete inactivity involved with TV-viewing  which alone raises the risk of high blood pressure  children may be compounding their sloth by eating junk food. "A full bag of chips or a plate of hot dogs can disappear a lot more quickly while watching TV than they might at any other occasion," says Ludwig. And the types of foods that children are likely to be eating in front of the tube, like salty snacks, can push up blood pressure readings. See the top 10 TV ads of 2008. See the top 10 tasteless commercials.